Right around the time Chick Bassist was published, I met a very, very cool person: author, photographer, and model Tiffany Scandal. 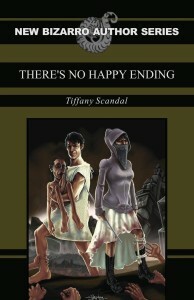 Tiffany’s debut novel, punk-rock apocalypse There’s No Happy Ending was just published as part of Eraserhead Press’s New Bizarro Author Series, and it’s easily one of the best books I read this year. Models from left to right are Dali Moon (Dali Suicide), Selene Suicide, Jessica (Persephone Suicide), Lyxzen Suicide, and Amanda (Rourke Suicide).